Dr. Klassnik. 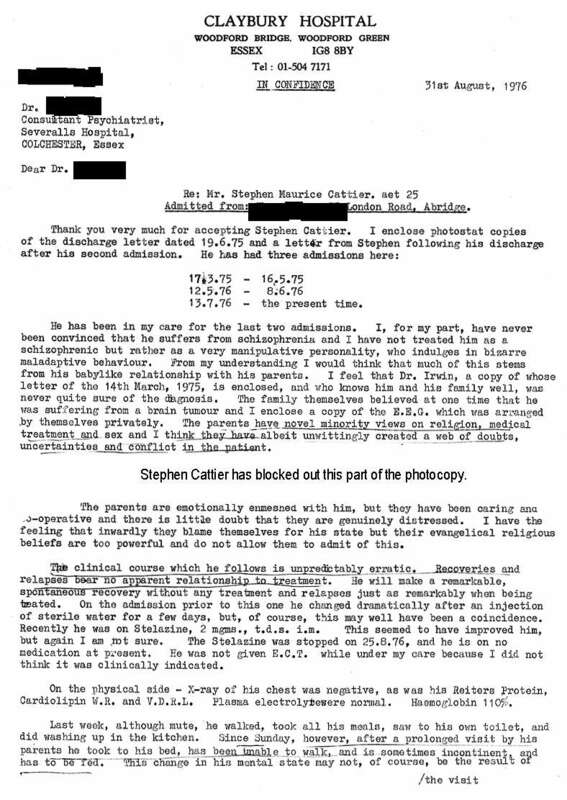 consultant neurologist, Claybury Hospita, report on Stephen Cattierl, August 1976. Dr. Klassnik's August 1976 report to Severalls prior to author's transfer there. I got walking for three days and did the washing up because the neurological injury had improved naturally enough but not sufficient to avoid a relapse occurring three days later owing to using the muscles too long walking back to my bed. I should have stayed off my legs for longer to allow the damaged nerves to heal enough to cope with it but I could not stand the pain anymore of the water injections. The letter only refers to one of them for about three weeks as far as I can recall. Also, I was too dejected owing to some nasty ill treatment by some nurses believing I was a malingerer. I shall be kind to them and put it down to righteous indignation because five weeks before that I had been discharged branded a malingerer and Dr. Klassnik told me I was going to have my sickness benefit stopped but it was not. I would not have suffered that relapse if I had been cared for properly or considerately with no injections. I had not consented to any medication or injections of water (see Redbridge Guardian and Independent newspaper report) as I was unable to communicate. Two days after admission I was told by a doctor that I was wanting treatment and he said that after commenting that I had run to the loo and back during the night - see later. They presumed I was consenting to treatment. I was in agony for a couple of days lying in bed so that must have been when the Stelazine was injected, but I was not told what the syringes contained at all. The second night I was there I actually ran to the toilet and back in my sleep. I was actually half asleep and so remembered it. It happened because I had been keeping to the edge of the urine soaked bed and I was psychologically propelled out of it running. For a while afterwards the over-using the muscles produced the feeling that a knot or two had been tied inside my head but no relapse happened. I could not walk when awake and could virtually not move. That was just one of the bizarre symptoms of the condition that has put the doctors off. After I got walking for those three days I suffered a relapse walking back to my bed owing to over - using the injured nerves and it had not one jot to do with my parents. They incorrectly got a lot of stick at beginning, poor things, from medical staff blaming them for causing my illness. I hope my parents did not lie to get me into Severalls saying they had moved to Colchester where a relative lived. I used that address to get into Severalls. My father was never a member of Jehovah's Witnesses and my mother gave it up for twenty three years in 1976. Kitty Willmott was not related. 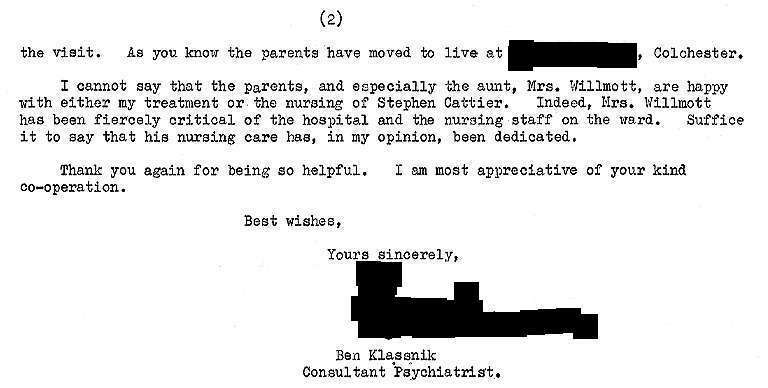 Dr. Klassnik thinks the care of me was dedicated, but when the "cat's away the mice will play" re. ill treatment by some of the nurses. Other nurses were normal particularly one lady who would always feed me whenever she was on duty. I would say I mostly received two meals a day.